No secret that walleyes move into shallow water come spring but a lesson I have had to relearn a handful of times over the years is simple, don’t be afraid to look for fish in a foot or two of water come spring. Many anglers will fish shallow particularly early in the year but often stop at that three foot mark. There are probably many reasons that cause walleyes to position themselves into a foot or two of water but I think most of the time, warmer water temperatures and baitfish are the two biggest motivators for pulling walleyes into such skinny water. 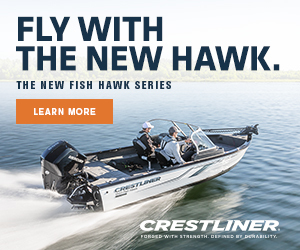 When it comes to finding walleyes in really shallow water, less than three feet… there does seem to be some misconceptions at least from my own personal experiences. Wind is probably one of the biggest misconceptions I have found from my time on the water. Wind and shallow water walleyes is almost cliché but I seldom find fish less than three feet of water during a strong wind that is crashing in. The fish may be active and they may be shallow but they typically duck right below the reverse current that is rolling back off the shoreline. In three foot rollers for example, I seldom catch fish in two feet of water, typically they are a touch deeper like five feet. When I often do find walleyes in this same location however in a foot or two of water is the next day. After the wind dies or switches and the water is still stained from yesterdays wind. That might be one of the biggest misconceptions about catching fish in a foot or two of water is that it takes wind. Some of my best days in this ultra shallow water are actually when there is no or little wind or wind actually blowing off the bank, fishing the calm side of the lake. I think one of the reasons for this is that walleyes don’t like to position right up into the turbulence. In really strong winds, I have actually seen fish like white suckers, bullheads and even northern pike get washed up into rip rap but I have never seen a walleye get washed up. What also surprises some anglers is that sunny days often pull fish shallowest especially during the pre spawn period. I have seen this on natural lakes, river systems and reservoirs. Also, this can be a big fish pattern as it often seems like big females will slide up into a foot or two of water just to warm up. Almost seems like some of these big fish will move up so shallow that the sun can hit their backs. The locations where we have seen these skinny water patterns unfold run the gamut. On river systems for example, most fish locate near current breaks and seems much of the time. Fish move out into fast water and they move back into quiet water but many fish are caught on the edge where faster water meets slower water. I have caught some really big fish in rivers however far from this edge quite a ways back into quiet water up along shallow gravel and sand bars or rip rap. Typically during normal flows, these fish might have only been fifty to a hundred yards or less from faster water but where they were sitting was slack enough for a largemouth bass to live. 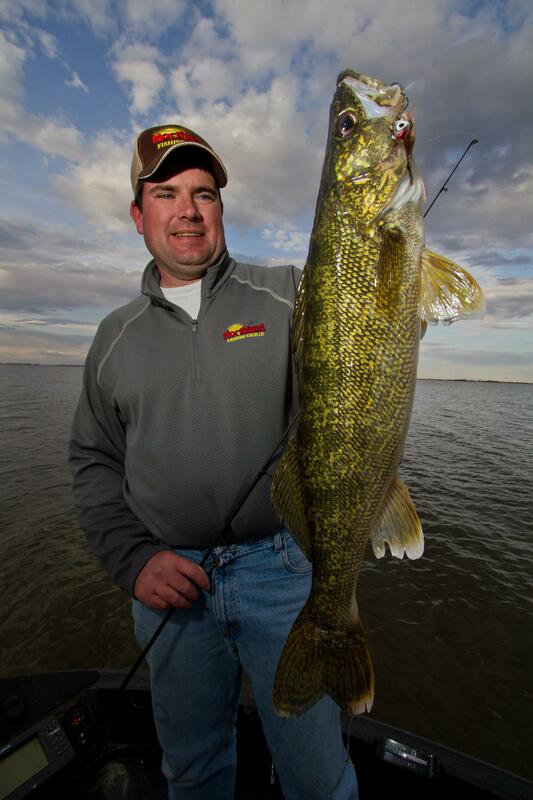 The author Jason Mitchell shares some wisdom on how to catch walleyes in ultra shallow water early in the year. On natural lakes and reservoirs, gradual sloping shorelines that had firm gravel to sand bottoms have been good. Rip rap is another solid option at times and shallow sand or gravel bars that have pencil reeds can be dynamite and are one of my favorite locations for finding walleye ultra shallow. Shallow rocks can also be really good but on many natural lakes and reservoirs I have fished, the rocks were often right on the shoreline in a foot or two of water and than out a little ways, the rocks either got much smaller or the bottom turned to sand and often, the fish seemed to hold right on the bottom edge of the rocks. The bigger the rocks, the more I found this to be the case. With these really shallow fish, you almost have to cast to the fish and there is nothing better than a jig because jigs only have one hook. Most of the time, you have to slide into spots and slip the jig up into this shallow water without making a lot of commotion. Big bomb casts with heavy artillery are typically not going to work. In fact, there have been many times where I had to pitch the jig up on the bank and just slide the jig into the water. That is why the single hook on a jig shines as they don’t catch as much debris or get hung up so much. From my experiences, there are two basic maneuvers that really trigger these fish with a jig in such shallow water. The first is to cast the jig up on to shore and just slide the jig into the water and slowly slide the jig through the zone with a drag or swim where the jig is just above the bottom maybe halfway through the water column. The other method that has worked really well for me is to pitch the jig up into the shallow water, feathering the line with your finger as it hits the water and keeping the line semi tight as it falls. With either method, the key is often using really light jigs with lots of bulk to slow that jig descent way down. You can fish a heavy jig slow but the slide and descent is still going to be fast and not give the fish as much time to respond. The hits however can be bone jarring so once these fish find and turn on the jig, they sometimes really chomp down on it. Typically, either 1/8th ounce or 1/16th ounce will suffice but you have to bulk up the jig by either adding plastic or a larger minnow so that the jig is easier to cast further distances and than slowly sinks once it hits the water. Favorite jigs for this presentation include the 1/8th ounce Northland Tackle Rocket Jig for dragging and the 1/16th ounce Northland Tackle Fire Ball bulked up with minnow or plastic for the slow fall. There are times as well when a 1/32nd ounce Fire Ball tipped with a live minnow is killer in really shallow water. With the lighter jig, hook the minnow on so that it stays alive and after casting the minnow up on the bank, let it swim around in the shallow water on semi tight line. This method is a little slower and takes more time but can often pull a few more fish off the spot. By far, I do much better using monofilament when targeting really shallow fish early in the season. I think mono slows the rate of fall for the jig and adds some subtleness to the glide and fall that just causes the jig to hang in the water longer which the fish seem to like. Perfect line for this application is seven pound Bionic mono. This particular line is easy to cast with lighter jigs but slows the jig down dramatically in the water. Depending on your height, a six to seven foot medium light fast action rod is about perfect for leveraging small jigs up onto the shoreline and the extra length lets you get a good hook set when the tip of the rod is high. 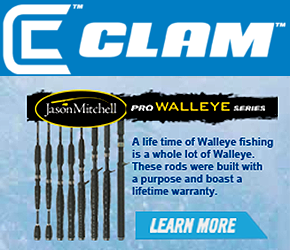 We have a new line up of walleye rods for this season (www.jasonmitchellrods.com) that are really impressive in that they retail for less than sixty dollars, feature; IM8 graphite construction, lifetime warranty and Fuji guide train. The weight and action of the JM641MLS spinning rod is perfect for pitching light jigs on light line. Early in the season, do not overlook sliding up into really shallow water when conditions dictate and at least check really shallow water. There have been many days in the past where the most aggressive and hardest hits I had all day were in water less than three feet. To fish such water effectively however takes some modification and technique but is definitely worth your time.